The last time we saw a 2-in-1 Toshiba Portege (the Z10t back in August 2013), we had a few concerns: its keyboard dock was unreliable during our tests, its battery life was short, and we found its configuration to be too noisy for our liking. Fast forward a couple of years and the Z20t is a brand new beast that rectifies a lot of what was questionable about the Z10t. It has a new dock design, its battery life is long, and it runs silently thanks to Intel’s advances in mobile processor technology. It’s a 12.5in, detachable (or hybrid, if you like) Ultrabook in which all of the processing power is located within the screen, but its keyboard base also has extra ports and an additional battery. You can use it easily as either a tablet or as a notebook, and you can even do interesting things such as switch it to ‘display’ mode or ‘tent’ mode when you just want to watch something or make a presentation to clients. This is due to the way the dock has been designed: it allows the screen to sit either facing you in a normal laptop orientation, or away from you in a display-only orientation. 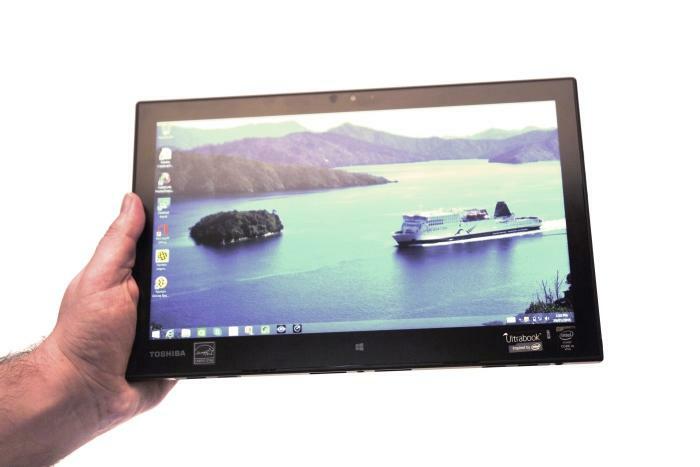 As a tablet, the Portege Z20t is undeniably good, especially for a Windows 8.1-based model. It feels light and airy, and it has a square design that’s comfortable to hold. More importantly, the screen has a matte, non-glossy finish from edge to edge, and it’s a finish that’s smooth on the skin. Its brightness isn’t extreme, which could be a problem when using the tablet in a brightly lit environment, but it also means that it’s easy on the eyes, especially while using it in dark environments. There is a native resolution of 1920x1080, but Toshiba ships the system with its icons and text set to the largest size that Windows allows, and this makes it easier to use for touch input (except for some windows that remain with small text), as well as easier to read. It’s an IPS (in-plane switching) panel that looks good from the sides, and it renders colours with a natural brush, rather than over-saturating them. It’s sharp for text and images, and there is plenty of contrast for showing small details in photographs and videos. That said, some might find its black level to be a little on the pale side. It's a lightweight tablet that's comfortable to hold and use. The square edges of the tablet make it easy to hold, and it’s a sturdy tablet that features magnesium alloy and a honeycomb construction. Ports and slots around the edges include micro-USB, Micro HDMI, microSD, and a headset jack. The volume and power buttons are side-mounted and tactile, yet they are not easy to press inadvertently. 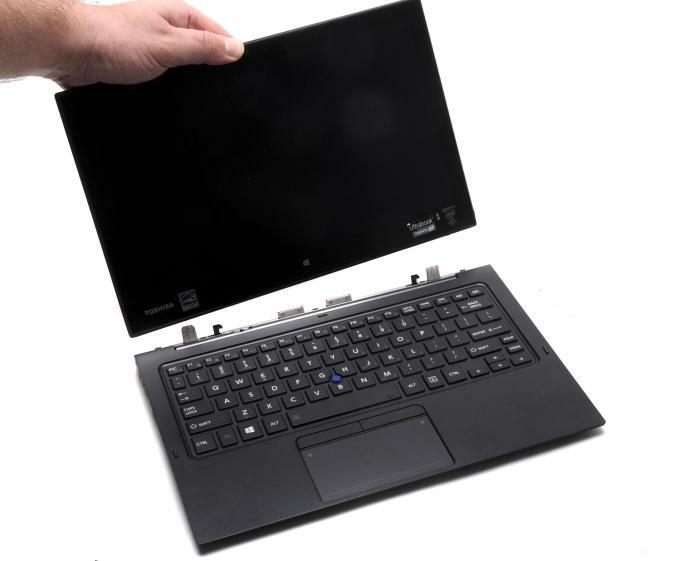 On some other Windows tablets that we’ve reviewed, such as the Lenovo ThinkPad Helix 2, we’ve noticed that the buttons can be hard to press, so we appreciate the ease with which we can switch off and change volume on this Portege. Inside this particular Portege tablet is an Intel Core M-5Y51 CPU that’s designed specifically for use in thin and light Windows slates, and 8GB of RAM. It has a fan-less design, which means that the tablet is a silent operator. After working for a while, the only warmth that can be felt is on the right side of the tablet, but it didn’t get bothersome during our tests. It seemed to warm up to a certain level and just stay there without getting warmer. Performance from the Core M CPU isn’t on the level of a Core i5 or i7 CPU, but it’s nevertheless good enough for typical office tasks and online communications. It also goes well for general image editing and the transcoding of small files. In our Blender 3D rendering test, it recorded a time of 58sec, which is 2sec faster than what the ThinkPad Helix 2 recorded with the same CPU. Graphics are handled by the CPU, and they are more than adequate for everyday operations that don’t include heavy gaming. A 3DMark score of 2843 in the Cloud Gate test is decent, but a little slower than the Helix, which got 3418 in the same test. Unlike the Helix, we didn’t experience any noticeable sluggishness while using the tablet for our daily browsing and work habits. It ran smoothly except for the odd pop-up from its pre-installed Norton software, asking if we could please activate it. Storage is supplied by a 256GB solid state drive (SSD), and it’s a quick one. It clocked a sequential read speed of 528.8 megabytes per second (MBps) in CrystalDIskMark, and a sequential write speed of 469.2MBps. These numbers are on the high end of the performance scale for a Windows tablet. In case the 225GB formatted capacity isn’t enough, you can install and forget a microSD card in the side. When it comes to battery life, the Portege Z20t is the type of Ultrabook a reviewer dreads. Its dual battery set-up means a lot more time needs to be taken to assess what the tablet can do on its own, as well as with the base attached. In our usual test, in which we use a high performance profile, maximum screen brightness, enable Wi-Fi, and loop a Full HD MP4 video file, the tablet ran for 5hr 19min. This is slightly less time than the ThinkPad Helix 2, which ran for 5hr 27min. Compared to the Portege Z10t, which we tested with a Core i5-3339Y CPU and an Xvid-encoded video, the Portege Z20t lasted two hours longer. With the aid of the battery in the base, the Portege Z20t ran for 11hr 27min, which is more than a double-up of the tablet on its own. We think this is a good result overall, especially since the Ultrabook isn’t an overly heavy one with both pieces combined. The power settings that you apply and the applications that you run will dictate how much battery life you will get for your own use. For example, you could possibly get an extra hour or more if you enable the ambient light sensor (it’s actually on by default but we disable it for our tests) so that the screen brightness is dimmed according to your surroundings. The battery in the base is used up before the battery in the tablet, and, conversely, the battery in the tablet is charged faster than the battery in the base. In order to use the Portege Z20t as a tablet, you have to tear it away from its base, and it’s an easy thing to do. Toshiba has designed the mounting mechanism to be loose. This mount consists of two metal poles and two female connectors in the base. The poles are inserted into two notches, and one of the the base connectors attaches to a male connector on the tablet. There are two female connectors on the base so that the tablet can sit in the base facing inward or outward. The poles are not a perfect fit, but instead allow the tablet to sit loosely. This is good in the sense that it allows you to simply unlock the tablet from the base and lift it up with one hand, without the tablet lifting up off the table. But it’s also bad in that the tablet screen wobbles back and forth noticeably in its mount when you move the Ultrabook around. It’s in no danger of coming loose from the base, but it’s disconcerting when you first start using the laptop, and could be an annoyance. To remove the screen, you have to move the release lever to the left. You can then lift the screen off the base to use it as a tablet. Two connectors are present on the base. They are needed because the screen can sit in the base facing inwards, and outwards. Using the Portege Z20t in your lap as a laptop is doable -- easily -- but there is a top-heavy lean to the product that could see it topple back on its own if you are not careful. This is despite the base being a little heavier than the tablet, with its own battery and ports. All up, the Ultrabook weighs 1.47kg with the base attached. Separately, the base weighs 769g and the tablet weighs 705g. It feels like a real laptop when you use it, despite the slightly top-heavy lean and the wobbling of the screen in its mount. This is because the keyboard is a good one. It’s backlit, the keys are a good size, soft to hit, and possess decent travel (at least for a Portege), and there aren’t any keys in awkward positions except for the Page Up and Page Down keys, which take up some of the width that would otherwise have been spent on the right Shift key. The F-keys are normal on this keyboard, which means that you have to press a Fn key combination in order to change brightness or toggle Wi-Fi. Volume functions are hidden on the ‘3’ and ‘4’ keys. The backlight has a timer, which means you don’t have to remember to switch it off if you won’t be typing for a while. 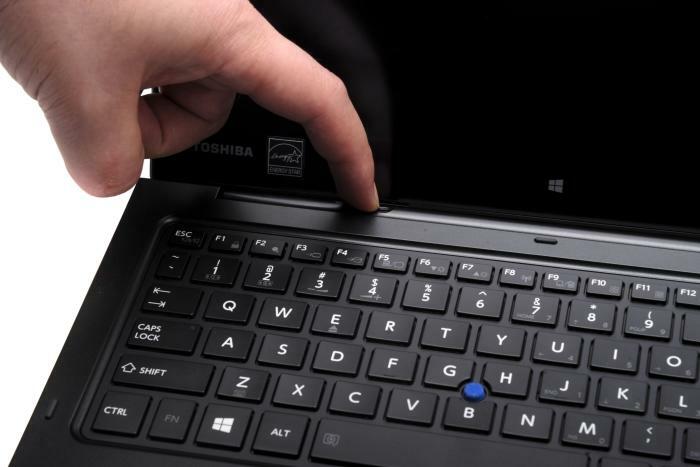 Both a touchpad and a TrackPoint-like stick are installed for navigation. The stick didn’t get in the way while we typed. The touchpad is decent, but not without its little issues. We couldn’t find a setting to reverse its two-finger scrolling direction. Furthermore, our vertical scrolling gestures were sometimes misinterpreted for a left or right swipe. We found it easier to just use the touchscreen for scrolling actions. At your desk, you’ll want to use a mouse. Luckily, there are two full-sized USB 3.0 ports built in to the base, as well as a full-sized HDMI port, a Gigabit Ethernet port, and even a VGA port. If you wanted to, you could leave the dock on your desk permanently, and just take the tablet away with you. For times when you need to leave the tablet unattended at work, the Kensington lock facility can first lock the tablet to the base before the Kensington lock is applied to the base, meaning that the tablet can’t be removed when the lock is in place. Other things to note are that the tablet has both front and rear cameras, you get dual-band, 802.11ac Wi-Fi (Intel Wireless-AC 7265), Bluetooth, TPM 1.2, and there is a slim digitiser pen hidden in the bottom of the tablet that can be used for handwriting and drawing (as well as a larger pen that you can carry around for greater control -- thanks to the commenter for reminding us). This is another differentiating point from the Z10t, which didn’t come with a stylus. It works impressively with the screen for handwriting and drawing, mainly because the stylus travels over the screen so freely -- we found it a joy to use, though we can see some users wanting a bit more traction. We found that the cursor target on the screen isn’t 100 per cent accurate when trying to select tools or menu options close to the top edge of the screen; we sometimes had to move the pen a bit off the screen to select something. The Toshiba Portege Z20t may be aimed at the business market, but its credentials are excellent for home usage as well. Toshiba told us it will be releasing a consumer version of this product eventually, but that it will be glossy as that is what consumers prefer. We think that the anti-glare display of this tablet is what makes it so desirable. It really is one of the nicest Windows-based tablets on the market because of it, and one that we turned to many times while lounging on the couch. The texture of the screen against the finger, the lack of a frame around the screen, the matte finish, and the accuracy of the panel, are all conducive to an enjoyable touch experience. It’s also highly capable as a notebook. The screen does wobble a bit in its mount, and the unit can be a bit top-heavy, but these aren’t noticeable issues unless you are using the Ultrabook in your lap or moving it around.